On July 6, 2018, we announced some optimizations to how we deliver Dynamics 365 for Customer Engagement apps updates: Modernizing the way we update Dynamics 365 for Customer Engagement. 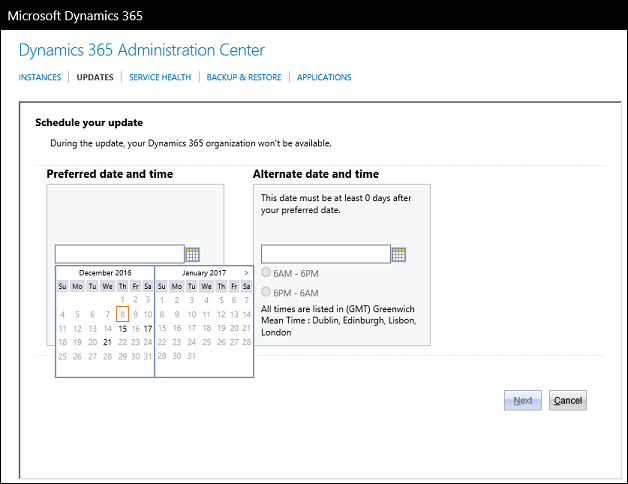 Microsoft will continue to support older versions of Dynamics within the timeframe of the details in our Update policy. Many update questions are answered here: FAQ for Dynamics 365 for Customer Engagement apps Update Policies. Check out the following blog: Previewing April 2019 release functionalities and updates for Dynamics 365 for Customer Engagement. 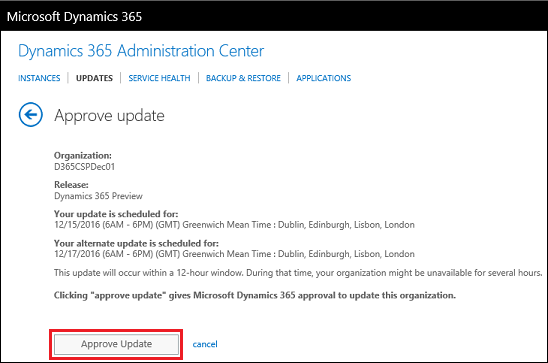 You have options for when you update your Dynamics 365 for Customer Engagement apps (online) organization to Dynamics 365 for Customer Engagement apps (online), version 9.x. To prepare for a smooth process, use the information in this topic. 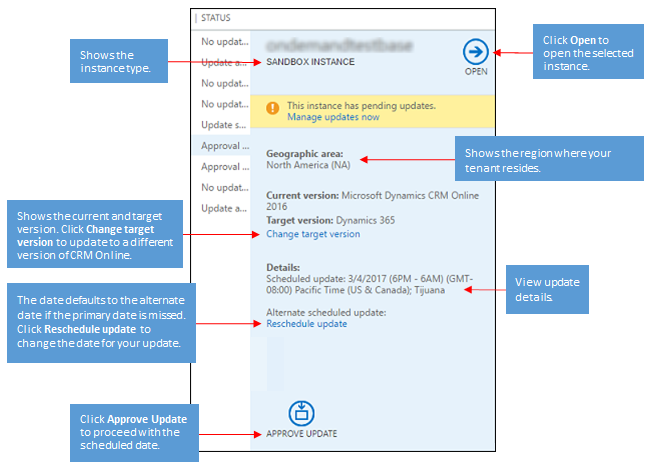 Review the information in the Updates page in the Customer Engagement apps Administration Center (https://admin.microsoft.com > Admin centers > Dynamics 365 > Updates tab) to find out what instances are ready to update, and the schedule. 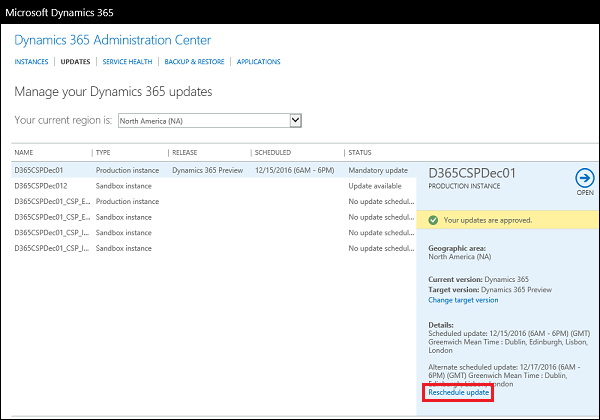 An update in this document refers to a major version release, such as upgrading from Dynamics 365 for Customer Engagement apps version 8.2 to version 9.x. Service updates do not require approval and are applied automatically to your instance. For major version updates, your instance will not be updated unless you approve it. This means your organization will go without the latest features and functionality until you explicitly give approval for the update to happen. Keep in mind, we do have an update policy that will make some updates mandatory, with no approval required. Please see Update policy below for further details. You’ll receive an email before the update is available with a scheduled update date. This email will also include instructions about how to reschedule the update, if you choose. You’ll receive reminders 90, 30, 15, and 7 days before the update begins. The update will happen during a 12-hour window, and during that time your organization might be unavailable for several hours. Most updates typically take 2-4 hours. We’ll let you know when your organization is updated and ready to use. For more information, see the Schedule for update communications later in this topic. We are transforming how we do service updates for Dynamics 365 for Customer Engagement apps (online). We will deliver two major releases per year - April and October - offering new capabilities and functionality. These updates will be backward compatible, so your apps and customizations will continue to work post update. New features with major, disruptive changes to the user experience are off by default. This means administrators will be able to first test then enable these features for their organization. Since every customer will be updated on the continuous delivery schedule, your organization needs to update to the latest version. For customers who are currently running older versions of Dynamics 365 for Customer Engagement, we will continue to provide you with the ability to schedule an update to the latest version and want to make sure this effort is as seamless as possible through continuous improvements in our update engine. 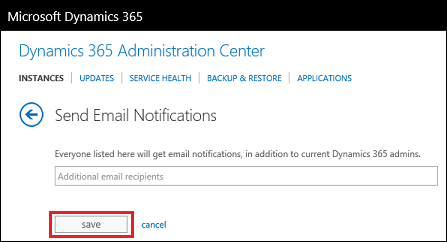 We will send reminders to schedule your update to Dynamics 365 for Customer Engagement administrators. For Dynamics 365 for Customer Engagement apps (online) customer engagement applications, we sent update communications in May to all customers running version 8.1 and have scheduled updates. Dynamics 365 for Customer Engagement apps (Online) version 8.2 will be fully supported until January 31, 2019. Customers running version 8.2 should plan to update to the latest version prior to this date. From February 1, 2019, onwards, we will only support the latest generally available version. Here are the recent versions. Your Customer Engagement apps update process depends on what version you have and how you’d like to update. Consider the following scenarios. For information on Customer Engagement instances, see Manage Dynamics 365 for Customer Engagement apps (online) instances. 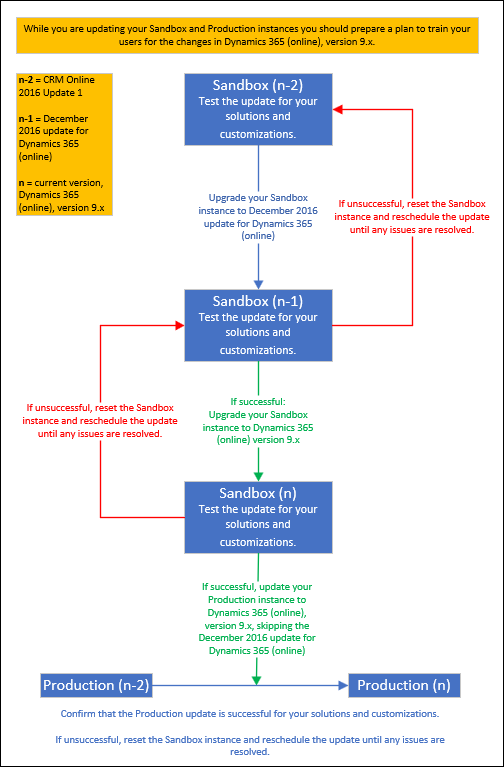 This scenario applies to those who have Production and Sandbox instances of CRM Online 2016 Update 1 (n-2). 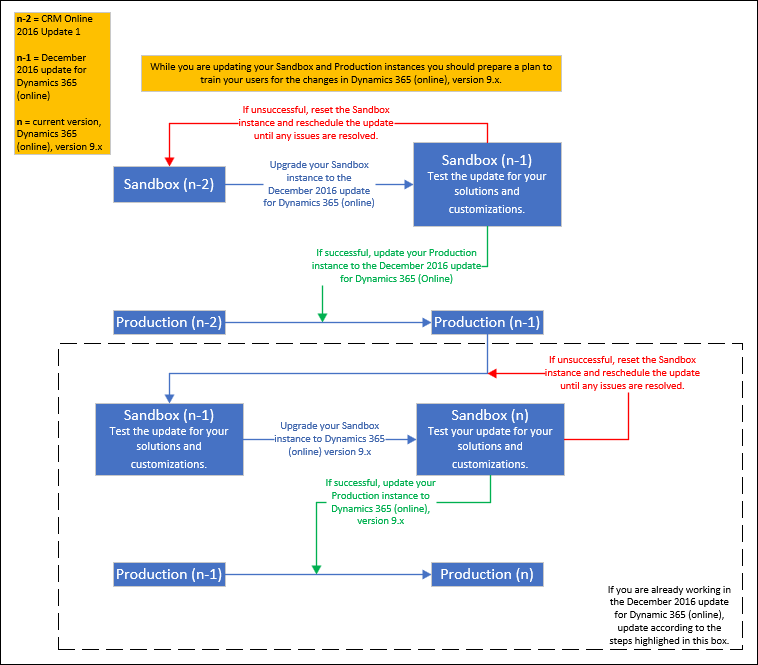 This scenario applies to those who have Production and Sandbox instances of December 2016 update for Dynamics 365 (online) (n-1). Follow the process in the dashed box in the flowchart above. To determine your version, sign in to Customer Engagement apps, and in the upper-right side of the screen, click the Settings button > About. How will I know my organization is ready to update? Customer Engagement apps system administrators will be informed of updates to Customer Engagement apps in multiple ways. 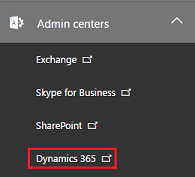 In the Office 365 admin center, click Admin > Dynamics 365. On the Instances page, click Updates, and then review the update status for your Customer Engagement instances. Instances that are eligible to update will see Update is Available. Clicking Schedule your update lets the admin select a target release and then do the scheduling. Customer Engagement system administrators will receive an email from the Customer Engagement apps Team. You can use the links in the email to learn more about your update or reschedule it. The “Manage your Customer Engagement updates” page is your source for useful information and actions to take regarding your update. If you are eligible to update to multiple versions of Customer Engagement apps, you’ll see an option Change target version. Large companies with extensive and complex customizations to their Customer Engagement apps may choose to upgrade to a later release instead of the first available. So you get the most up-to-date features and fixes, we highly recommend you upgrade to the latest version when available. You must be a Customer Engagement apps system administrator to approve updates. 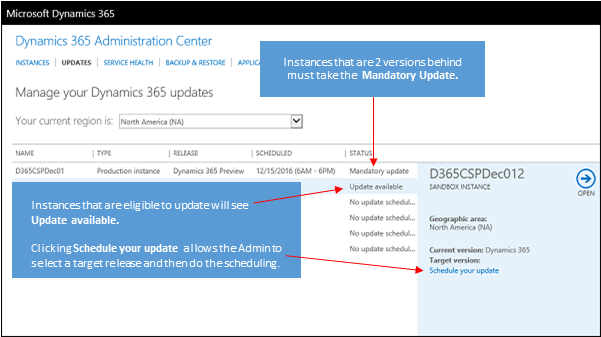 In the Office 365 admin center, click Admin > Dynamics 365, and then on the Instances page click Updates. Choose the instance to approve. Click Approve Update to approve and proceed with the update. Once you approve an update, you can still reschedule it as long as the update has not started. You must be a Customer Engagement apps system administrator to reschedule updates. Choose the instance update to reschedule, and then click Reschedule update. If you are eligible to update to multiple versions of Customer Engagement apps, you’ll see a page to select a target version. Select a version, and then click Next. Large companies with extensive and complex customizations to their Customer Engagement apps may choose to upgrade to a later release instead of the first available. So you get the most up-to-date features and fixes, we highly recommend you upgrade to the latest version when available. Keep in mind, if you are two versions behind the current version you will have a mandatory update. See Update policy for more information. Select new preferred and alternate dates and times for the update, and then click Next. Review the new dates and times, and then click Approve Update. The Status column will indicate your update is approved. To better track and manage your Customer Engagement apps updates, we added more granular update status to the Updates page. At the date and time of your update, the status for your instance will show Updating instance. Queued (Not Started) The update is queued and will start at the scheduled time. Backup The Customer Engagement instance is being backed up. A copy of the instance is backed up before the update for recovery purposes. Restore The Customer Engagement instance is being restored. Database Upgrade The Customer Engagement instance is being updated. When an instance enters the Queued (Not Started) state, that instance’s storage is temporarily omitted from the Total Storage Used calculation. Once the database update is complete, Total Storage Used calculation will be refreshed to re-include that instance's storage size. By default, Customer Engagement admins will receive update notifications. You can add others to receive update notifications. 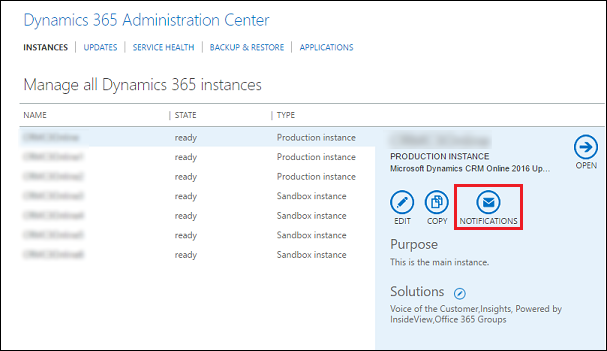 In the Office 365 admin center, click Admin > Dynamics 365, and then click Instances. Choose an instance that has notifications you want to change, and then click Notifications. Enter the email addresses of people to receive update notifications for the selected instance, and then click Save. What happens after an update is approved? When your update has started, you’ll see Update in progress under Status. The Reschedule option will no longer be available. When your update is done, you’ll see Updated successfully. Dynamics 365 for Customer Engagement, version 9.x contains a number of exciting changes. To take advantage of new features, you need to ensure any customizations are compatible with this update. To prepare your users for the changes to Customer Engagement apps, visit What's new in Dynamics 365 for Customer Engagement apps (online), version 9. Most of the update process is handled by Microsoft. However, there are a few things that you must do to prepare. Know when your update is scheduled. You will be informed of a pending update in multiple ways. See How will I know my organization is ready to update? in this topic. Involve your Dynamics 365 for Customer Engagement apps partner. If you have a Dynamics 365 for Customer Engagement apps partner of record, we strongly recommend that you contact them for guidance and assistance. If you do not have a partner, you may consult the Microsoft AppSource to identify a partner. Please note that there may be charges from partners for their services. Watch for communications from Microsoft. We will send you several communications about this subject to keep you informed about the update. In addition, we send email communications to users who have the System Administrator role in Customer Engagement apps. Please make sure the email accounts associated with those user accounts are valid and being monitored. Communications will come from crmoln@microsoft.com, or for partners, you will also receive communications from the Dynamics 365 for Customer Engagement apps Partner Team: crmteam@microsoft.com. Verify your customizations are compatible. You should take the time before your update to verify that customizations are compatible. You should do this early enough that you have time to fix any identified issues. Additionally, Microsoft will run a number of automated tests, and if any of those tests fail in your instance, we will email the administrator a list of potential issues we have identified. Create a non-Production (Sandbox) instance in which you can test your customizations. Notify your users prior to the update of Customer Engagement. It is a best practice to notify your users that the system will be unavailable during the update. To get more resources to prepare users for the update, please visit Onboard your organization and users. Watch for Update Completion or Reschedule emails from Microsoft. Once your organization is updated, you’ll receive a notification from Customer Engagement apps indicating that your organization is ready to use. “All Admins” includes Customer Engagement apps system administrators and Office 365 Global administrators.